I’m a huge believer that if you really want to understand something, you need to teach others what you’ve learned. While sprinting may not be the first thing that comes to mind when you think of Mike Robertson*, I’m totally ok with that. Because ultimately in team sports, the goal of a coach is to build a complete athlete – not someone who is awesome in one physical quality. Today, I’m going to give you five things that I’ve learned and applied over the years with regards to sprint training. Enjoy! One guy that I’ve learned a ton from with regards to sprinting is Nick Winkelman. In a handful of resources and interactions, he’s made mention of using drills to provide context for your athletes. For example, a young man I’ve been working with really struggles to get a solid body lean when accelerating. Instead, he has a tendency to pop straight up out of his starts, which slows him down and doesn’t allow him to use the incredible strength he’s built in the weight room. To combat this, my goal was to choose a handful of exercises to help him better understand and feel the body position I wanted him in during acceleration. In this case we started with wall drills and heavy prowler sprints. He picked up the wall drills immediately but it didn’t fix the underlying issue. The prowler sprints, however, made an immediate impact. You could see him get into a more naturally angled torso position, and he started to strike more cleanly on the forefoot (versus the toes). But the real value here wasn’t that I gave him a cool drill. Once he learned the appropriate position via the drill, he now had context for the position I wanted him in when accelerating! I can’t stress this high enough, but when it comes to sprinting it’s not about using every drill or exercise you have at your disposal. Instead, the goal is to find a specific deficiency or issue you’d like to address with regard to their mechanics, and then find a drill that provides context as to a more correct (or superior) way to get the job done. These next three points all kind of go hand in hand, and I think they’ve been some of the biggest takeaway points for me as a coach. Firstly, the arms drive the legs. If an athlete has spent time in the gym and gotten strong, it’s easy to put all of our emphasis on the legs when you take things out to the track. And when we’re putting all of our emphasis on the legs, our sprints tend to look heavy or “muscled,” versus light and crisp. To fix this, I think it helps to switch the focus entirely onto the arms versus the legs. 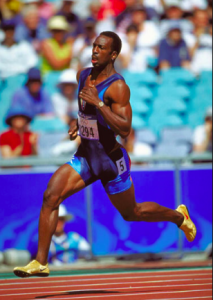 Powerful arm action can not only get the body moving quickly during acceleration, but the simple cue of “arms” can refocus the athlete at top-end where they might have a tendency to get tight or put too much emphasis on the legs. This was reinforced even more to me after a discussion with my good friend and fellow IFAST’er Ty Terrell. Ty would have his athletes run in place, and then have them attempt to pick up speed with the arms while keeping the legs at the same speed. Quite simply, you can’t do it – because the arms and legs are intimately tied together. Sometimes in coaching, it’s not about fixing something the athlete knows is the problem, but doing the opposite. 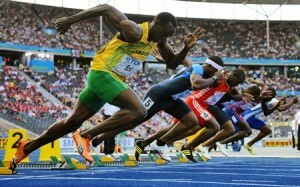 Focus on fixing the arms versus the legs and see if you can’t coax a faster time out of your athletes. As a former powerlifter and recovering meathead, tension is your friend. Quite simply, the tighter and more compact you can make yourself, the more weight you move. And the more weight you move? But sprinting and running fast are different from lifting weights. The goal is to run fast – not to run tight. During the initial phases of acceleration you need a longer ground contact time so you can overcome inertia to get going. In this case, “muscling” your runs a bit isn’t the end of the world. But when you start to transition to top-end, or get into top-end and speed endurance, all that muscling is going to slow you down versus speeding you up. In any of our practiced speed work, we’ll also make sure to do relaxation drills immediately prior to our runs. Without any cuing, I think this reinforces how we want our athletes to feel when they are running. Getting stronger is critical for acceleration, as again, ground contact times are longer and the muscles have more time to generate force. But at top end speed for a 40, 60, or a 100 yard/meter dash, you have minimal time to generate force, and this is why impulse is so important. To improve impulse you need a shift in your mindset with regards to the weight room. Max strength work is great for getting strong and helping with acceleration, but we need something more to improve impulse and force production at high speeds. If an athlete needs to improve their top-end speed, you can focus more of your training time on reactivity and elastic properties (plyos and jumps) versus heavy strengthening exercises in the weight room. Plyometrics and jumps of all varieties put a greater focus on the tendons, reactivity, and utilizing the stretch shortening cycle. Strength training in the gym, on the other hand, puts more of a focus on the muscles and pure strength. 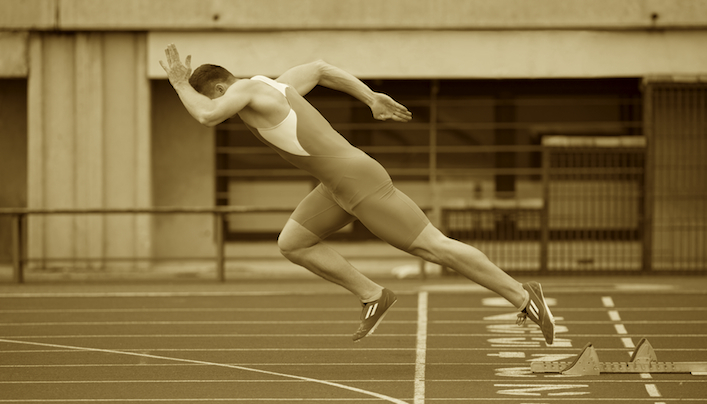 Furthermore, single-leg bounds can have an immediate carryover to sprinting performance, as they force the athlete to create force quickly. While you may not want to use these methods year-round, a cycle or two of reactive and explosive work prior to camp may be hugely beneficial for the overall explosiveness and top-end speed or your athletes. I don’t know about you, but the late Charlie Francis, Dan Pfaff, Boo Schexnayder – the legends of track – yeah they don’t have to worry about me taking their jobs any time soon. I’m getting better, but I’m definitely nowhere near where I want to be when it comes to sprint training and coaching. One of the biggest issues when transferring your game from the weight room to the track, however, is how fast these athletes are moving. As a coach if you’re used to watching slow, grind it out lifts, you have time to see what’s going on. But when someone is running a full speed 40, 60 or 100? Well, that’s a different story! As such, I think it only makes sense to use video whenever possible. Get footage to see how the athlete looks, and the body positions they are creating. What do you want to work on, or address? And what is absolutely, positively holding them back? Just like you don’t learn to ride a bike by hopping on a two-wheeler and going, don’t be afraid to use training wheels with your sprint coaching, either. Use video to slow things down and allow you to see what’s really going on. As I alluded to up front, the goal of a physical preparation coach is to be balanced in your ability to program and coach various physical qualities. And if you want to create great athletes, helping them run faster then the competition is a key distinguishing factor between the good and the great. Last but not least, if you want a resource that goes into great depth on sprinting and speed work, definitely check out Travis Hansen’s Speed Encyclopedia. It’s a very solid resource, and one that’s very reasonably priced to boot. What would you do for relaxation drills immediately prior to your speed drills? When I was in graduate school I remember learning about a classic experiment by AV Hill that taught the opposite of what you seem to be suggesting in point #4. I was taught that the key to High End Speed was actually Maximum Strength while Rate of Force Development was the key to acceleration. Have you heard of that study and how do you think it applies to the thoughts that you shared? I think you make a good point about the importance of impulses when running at high speed, it makes sense to me, but it flies in the face of what I thought I knew! Thanks.